Apprentice competition: Two’s a crowd? Not in this case! 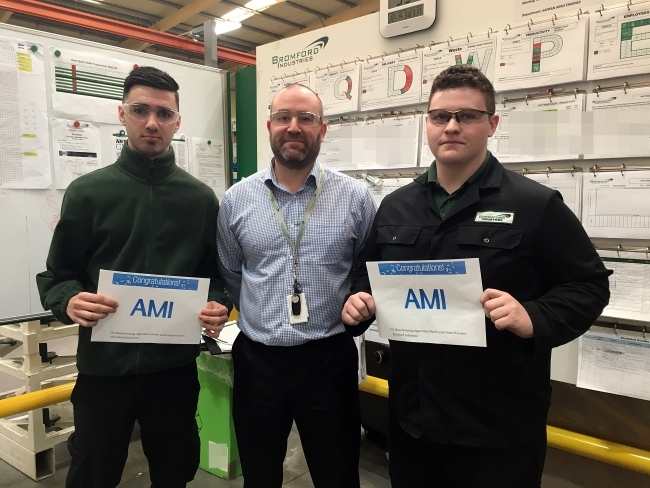 Put forward for recognition by Marketing Coordinator, Lilyana Stoyanova and Operations Director, Mike Tew, both apprentices are exceeding all expectations academically and within the workplace, therefore it was an easy decision for organisers AMI to award both Josh and Michael. Josh and Michael now qualify for the AMI UK Manufacturing Apprentice of the Year 2018. The competition has been launched to find and recognise the very best apprentices currently working within the UK manufacturing industry. The initiative has been set up AMI, a web design & marketing agency that specialises in supporting UK manufacturing companies. Bromford Industries is a specialist precision machined component manufacturer for commercial airliner aero engines and main landing gear. Operating from 3 locations in the UK – Birmingham, Leicester and Alcester, the company specialises in engineering solutions utilising core competencies including, complex machining and fabrication of superalloys, supply chain management expertise, specialist finishes and assemblies, all fully integrated and supplied to customers’ requirements. With circa 300 employees across three sites and a growing turnover, Bromford Industries is a premier supplier of performance critical parts.